Today is the day. 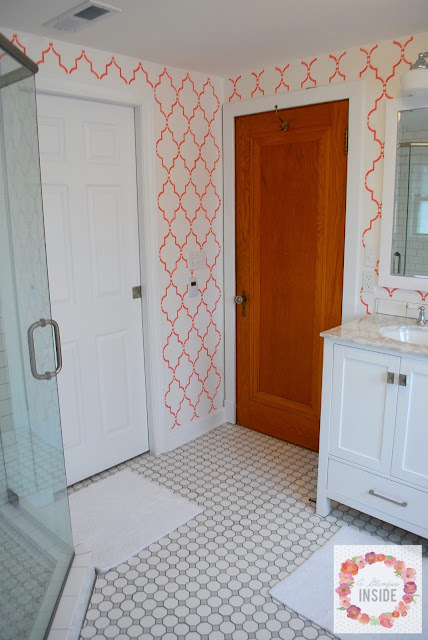 I am finally sharing our bathroom remodel. 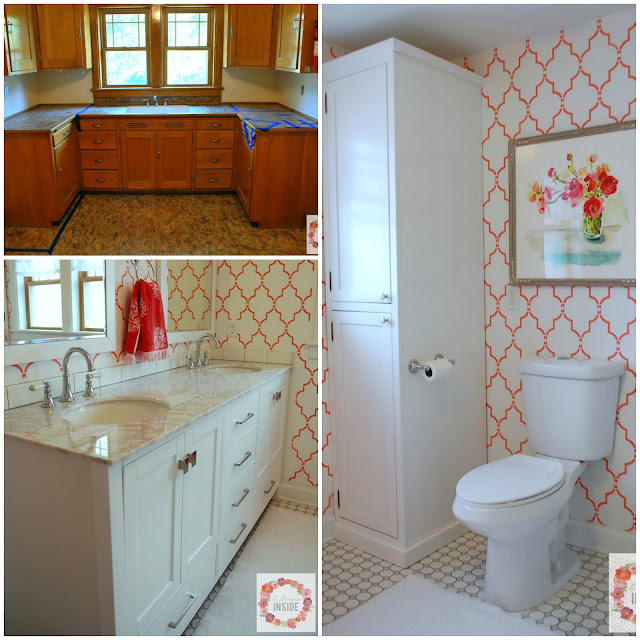 It has been a long time coming and I am so excited to be sharing one of two construction projects that went on in our house last year. I will start back at the very beginning and remind you what this space looked like before this project began. It was an old former kitchen stuck in 1940. 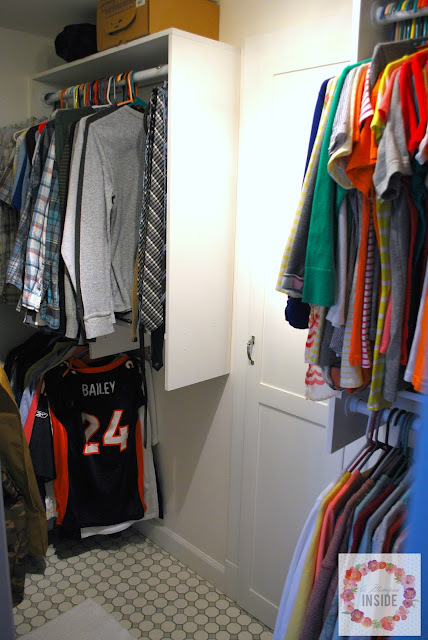 And the other side was a make shift closet from the previous owners with the old broom closet from the kitchen space. It wasn't a very bright space and it was very... brown! 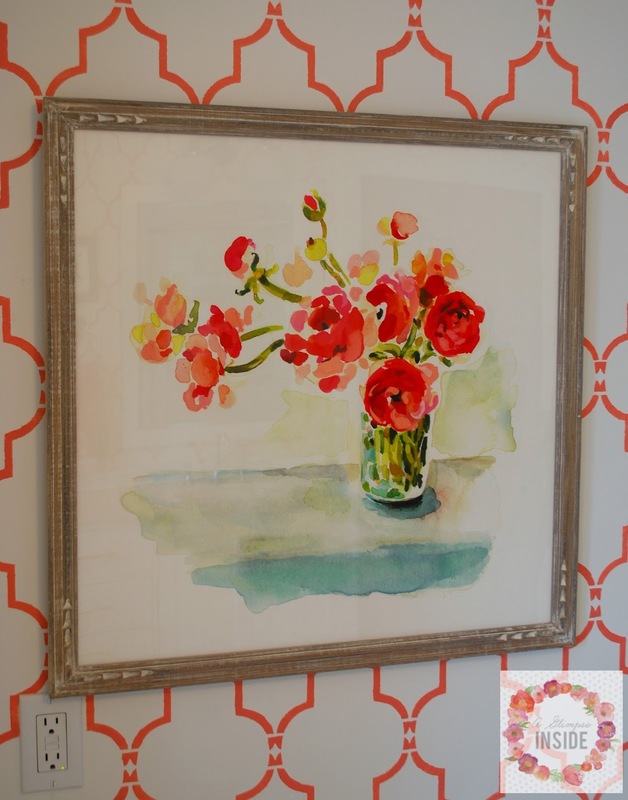 I took the design in the complete opposite direction, bright white with a pop of color and I LOVE IT!! This is the view of the bathroom from the bathroom door. I'll work my way around the room sharing some details as I go. 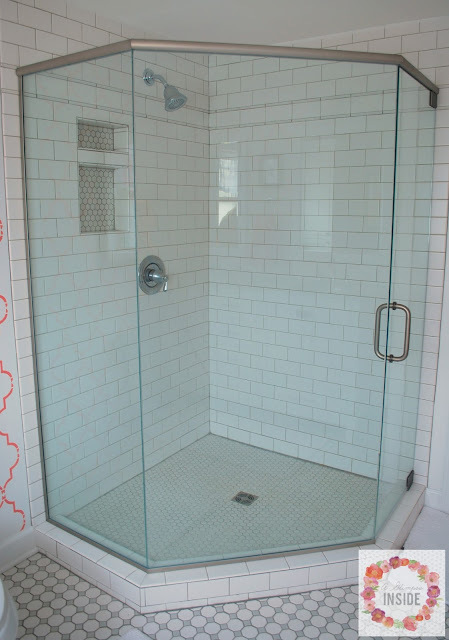 As you walk into the room, the first thing you see is our large walk in shower with glass and floor to ceiling tile. 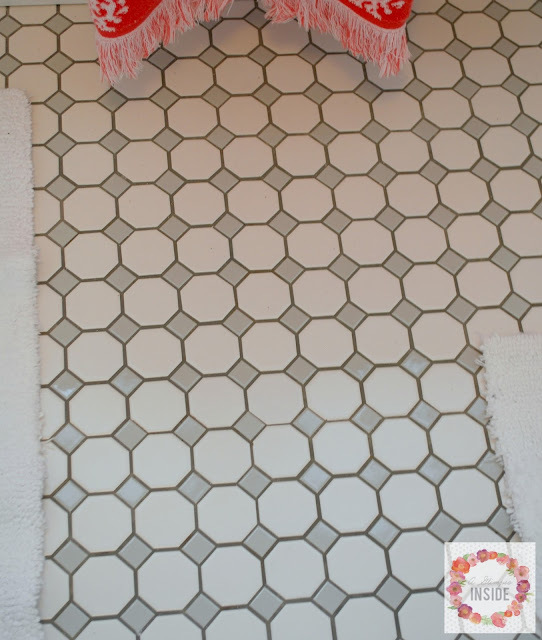 I shared a close up of the tile in yesterday master bathroom post. We had a problem with the glass. 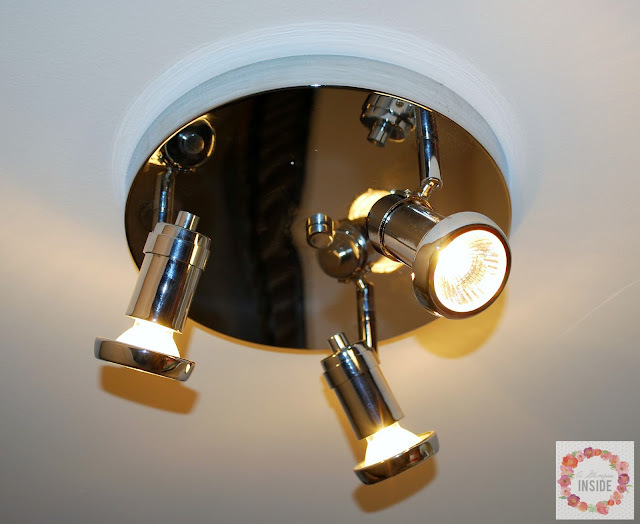 The metal finish was suppose to be chrome like the rest of the fixtures in the bathroom but it was ordered in brushed nickel. Again, we weren't thrilled but since it would take over a month for a new one to arrive, we just had them install it and luckily we got money back from the place we ordered it. 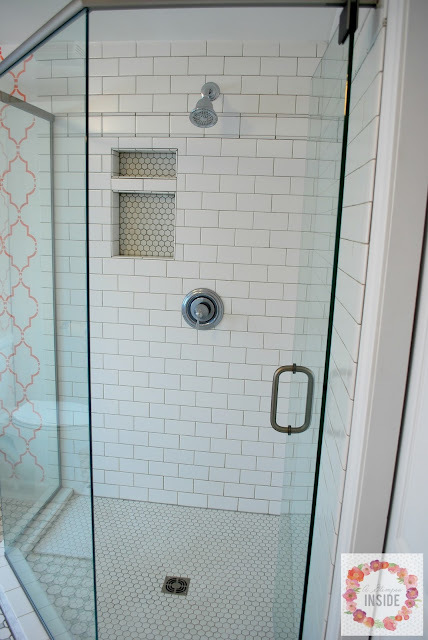 The shower door faces the main bathroom door and it can swing both ways for easy entry and exit. 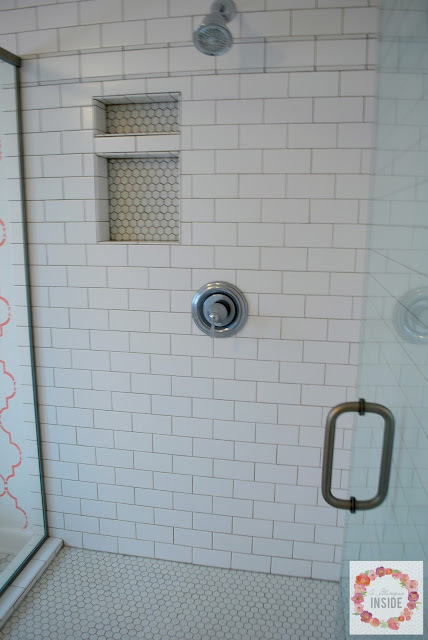 We went with chrome shower fixtures and the little nook in the wall is great for holding all the shower essentials. 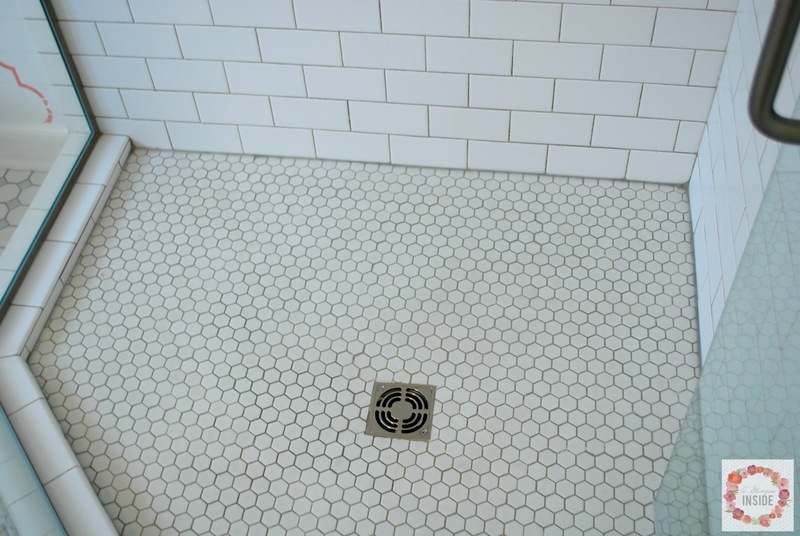 There is even a chrome drain cover in the center of the shower floor with is small hexagon tile. The floor of the entire bathroom is this lovely gray and white hexagon tile. I love it but unfortunately, it isn't perfect. It is bad when you hire someone to do a job for you and you think "hmmmm, I think we could have done it better ourselves!" Some of the tiles are spaced farther apart than others. Some of the gray tiles popped out of the mesh backing and weren't placed in exactly like they should have been as well. For a perfectionist like me, it bugs me! But it is what it is! From the left of the shower is the dual flush toilet we bough from Home Depot and in the corner is the linen closet we had made by an Amish carpenter that lives in a town south of us. I bought this print from Minted and I love it! 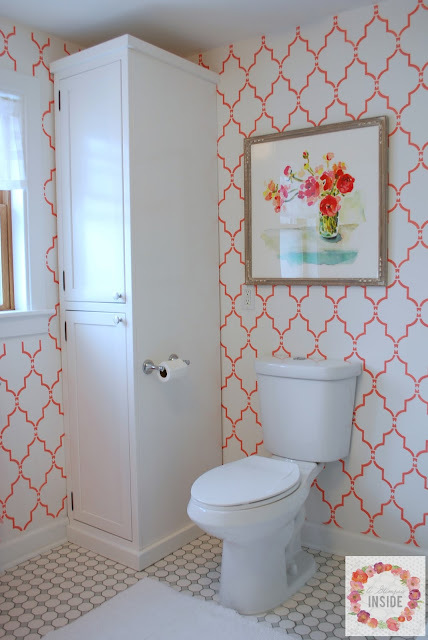 It fits great above the toilet and it goes so well with the wall stencil. 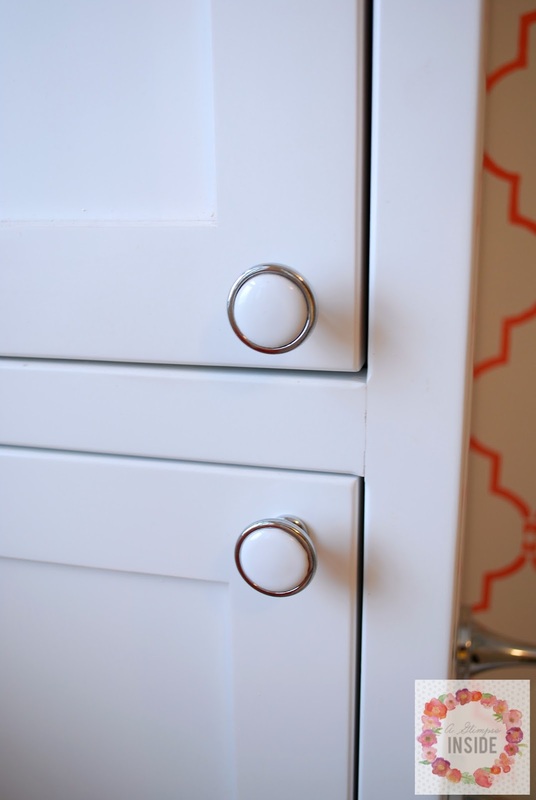 When we ordered the linen closet, we didn't have them add any knobs for us. 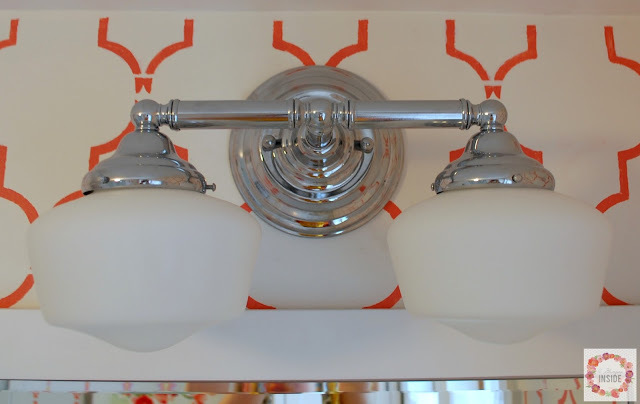 I found these, also at the Home Depot, and loved how they tied into the faucets so they came home with us and Travis installed them. Swinging to the left again is the window. We hung a double towel rod under the window since this was really the only place it could fit. I found the coral towel on clearance at Target and snagged them up. 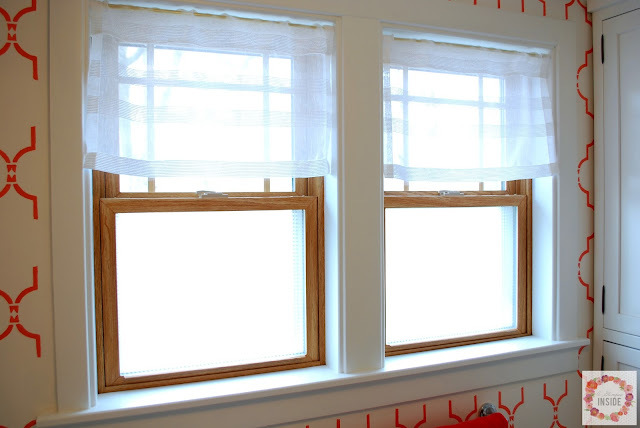 The trim around the window was originally natural wood and I painted it out white. Then we applied frosted contact paper to the lower windows to give us some privacy but still allow plenty of light in during the day time. 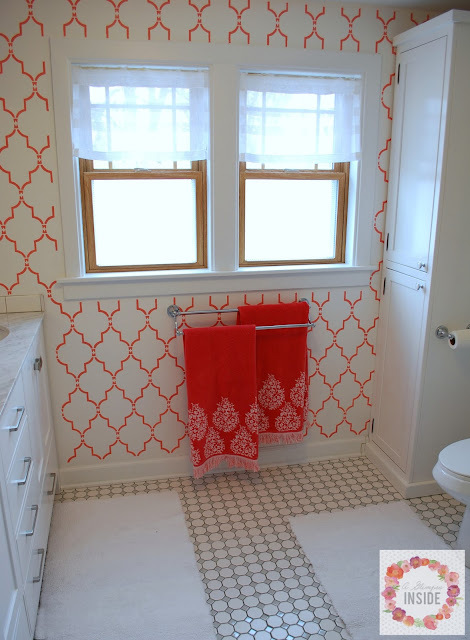 I bought a curtain panel at Target that I liked and cut it up and resewed it into two valences. I've done this trick a few times in this house and it is so easy! And now for the vanity wall. As I stated in yesterday's post, I found this vanity on Amazon after looking everywhere for something that Travis and I both liked. It also came with the two mirrors so that was nice since that was checked off the to buy list. Then between the two mirrors we hung a towel holder. I just kept the white rugs we used in our master bathroom from our old house and just bought 2 new large ones, one for in front of the vanity and one for the closet. .And above those mirrors hang these gorgeous lights that I again found at the Home Depot. 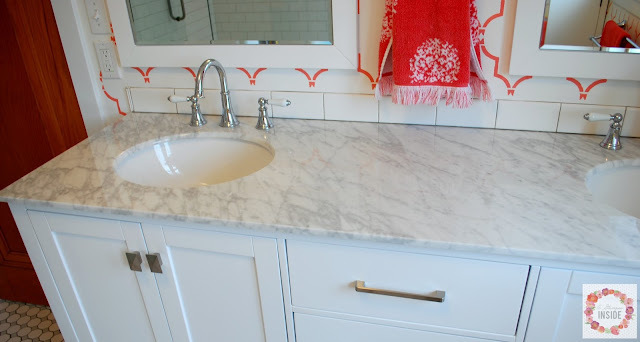 The vanity came with this pretty Carrera Marble top on it. 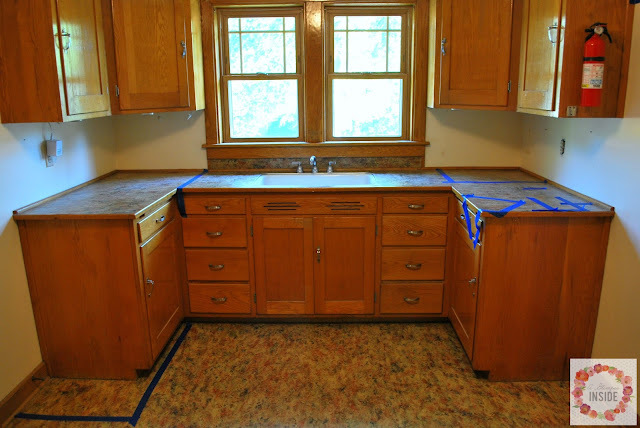 It has beautiful veining and helps tie in the gray in the tile on the floor. We also used some remaining subway tile to create a back splash for it . 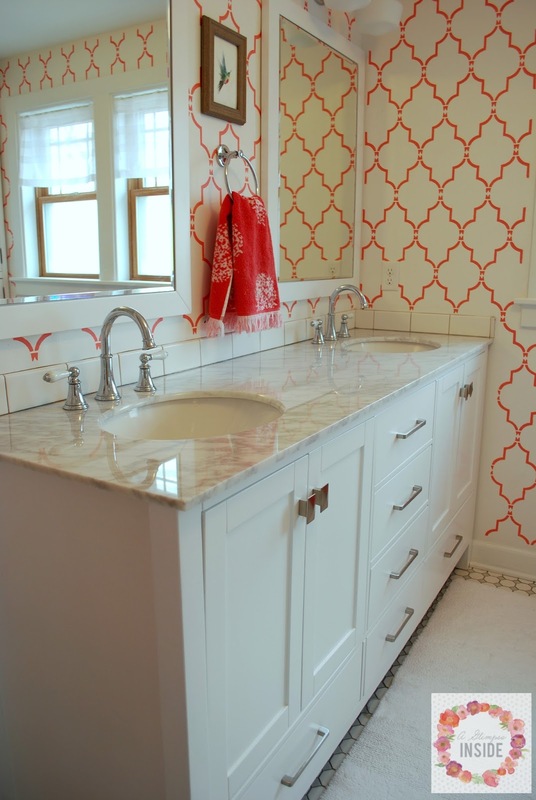 The jewel of the vanity are the faucets with the white handles. 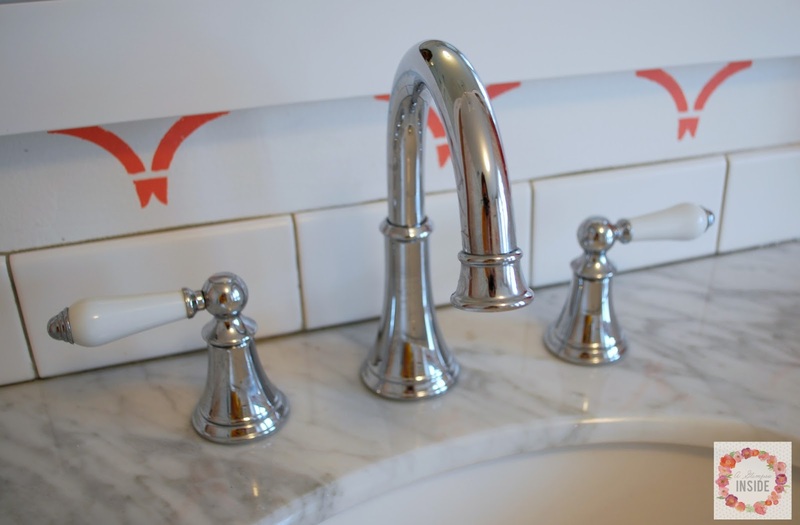 The spout if swivels to help you easily rinse the sink. 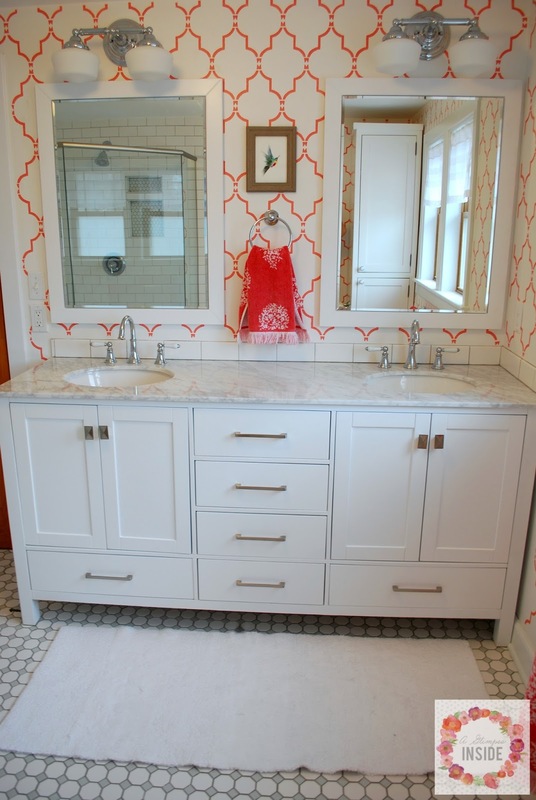 This vanity is seriously so awesome with its soft close doors and drawers and I will be so sad when we move! 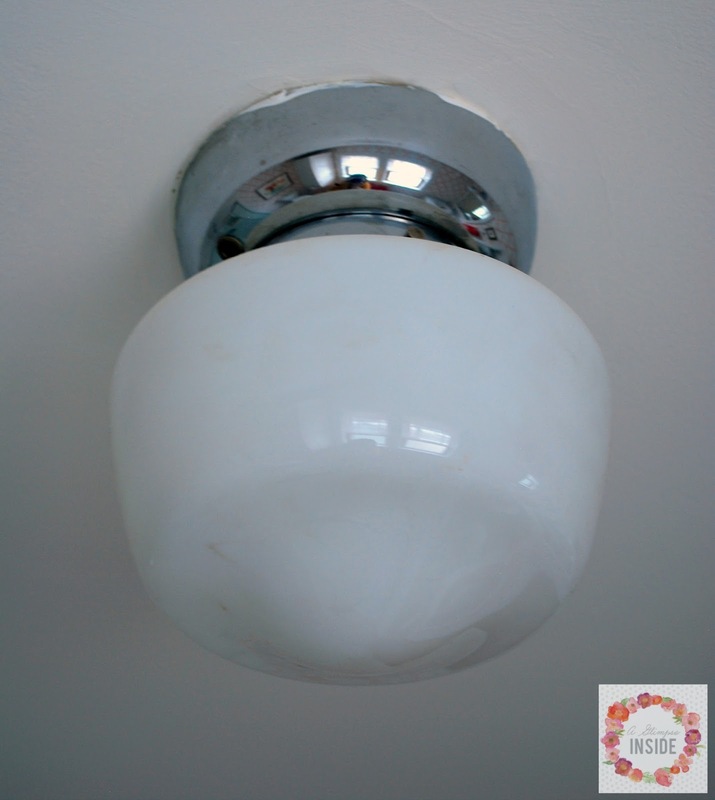 We kept the original light that was in the room we just had to recenter it in the room since we built a wall for the closet. And swinging to the left once more, you will see the new wall and the bathroom entrance. We kept the original door and I just painted the outside trim white like I did the windows. 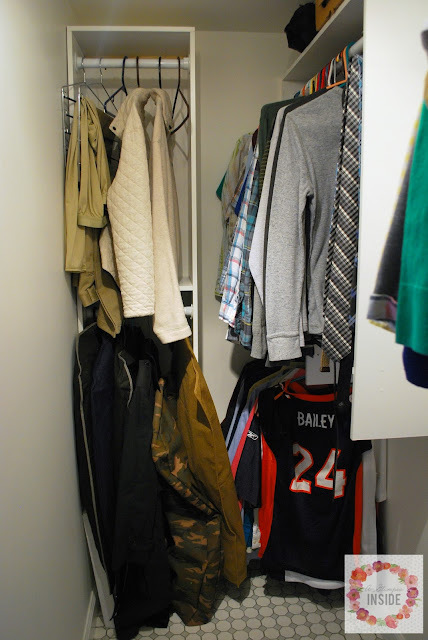 And in the new wall, we added a pocket door into our new closet. 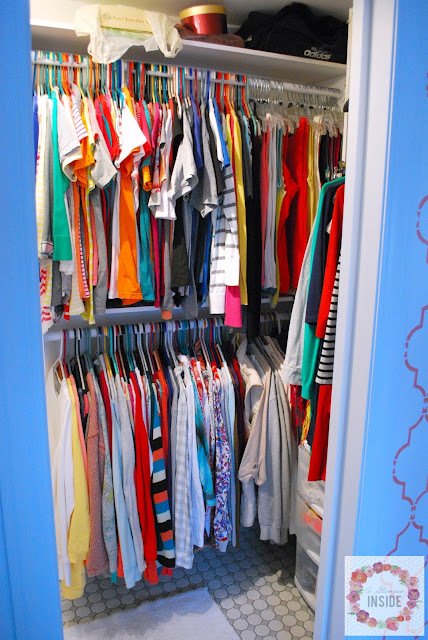 Here's a quick tour of the closet now. 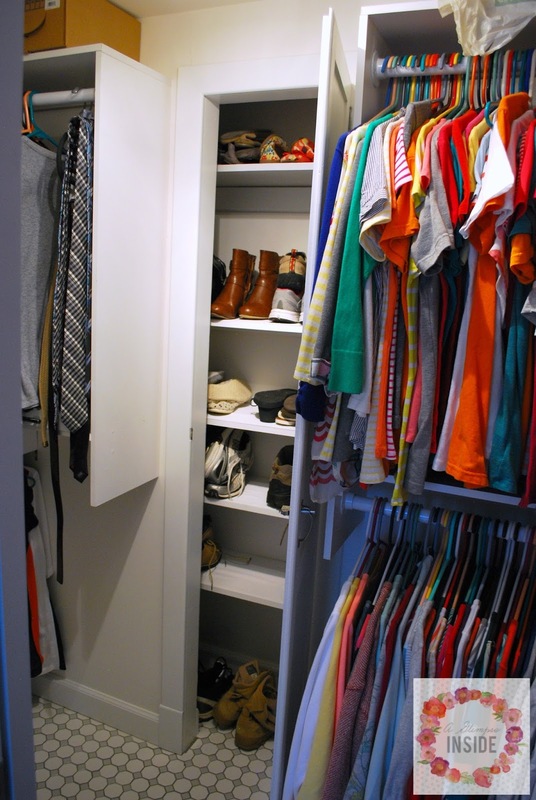 Open the door and you are greeted by my side of the closet and my clothes. 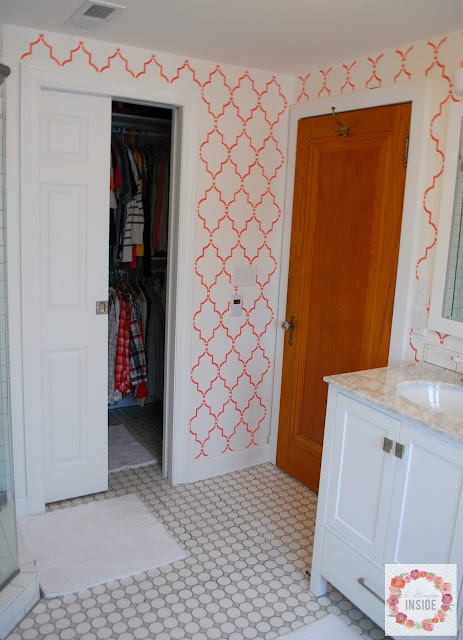 We carried the floor tile all the way through the closet and into the small broom closet. I painted out the old broom closet white and then we built our own closet system that worked for us and our space. 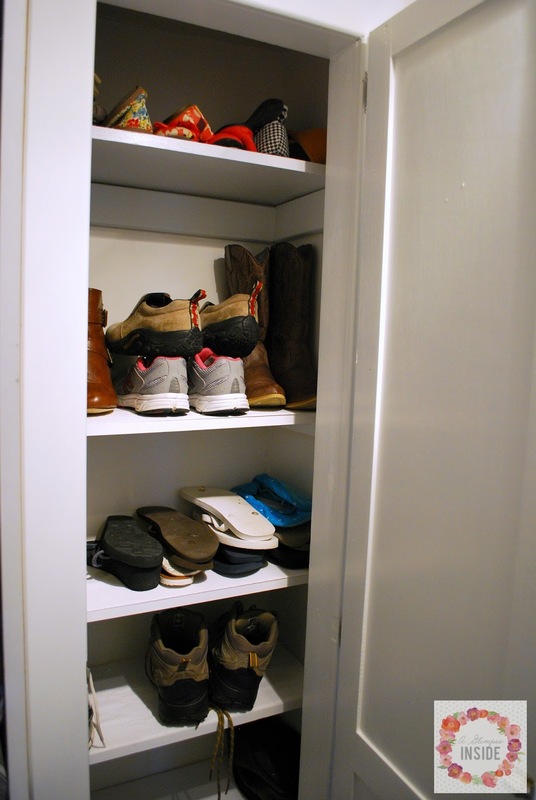 Travis has a small double hanging shelf on the short wall and then another double hanging shelf unit on the large wall. He plans on building a drawer and pull out for his pants as well. 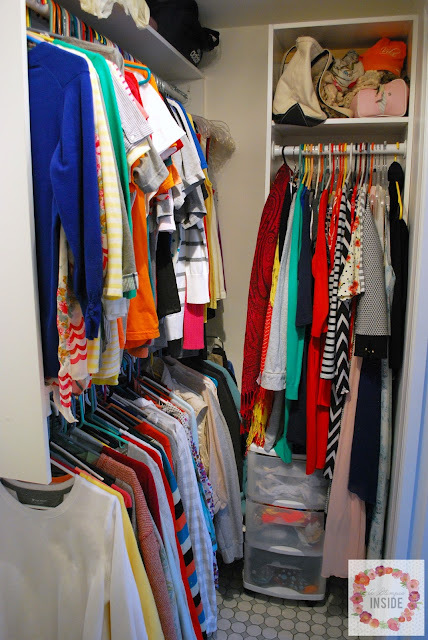 For my side of the closet, we built another double hanging shelf on the large wall. Then on the short wall we built a tall shelf for my dresses that has a small shelf on top of it. 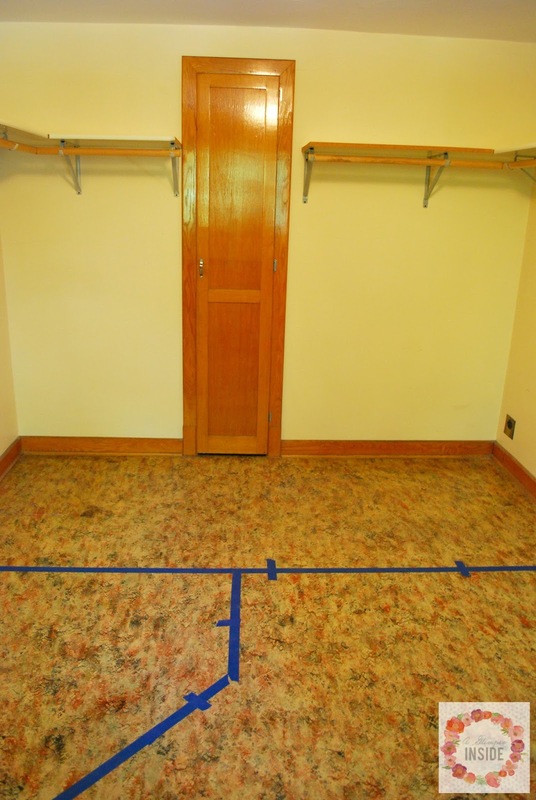 And that old broom closet?! It makes the most PERFECT shoe closet!! There was already the top shelf in the closet so we just added a four more to make it totally functional. And since this space was open previously we had to add a light in the closet. I found this little track light per say that works perfectly. We aimed the lights towards Travis's side of closet, one toward my side of the closet, and the third ones goes into the show closet. Our former kitchen turned master bathroom! From dark and brown to bright, white, and cheery! 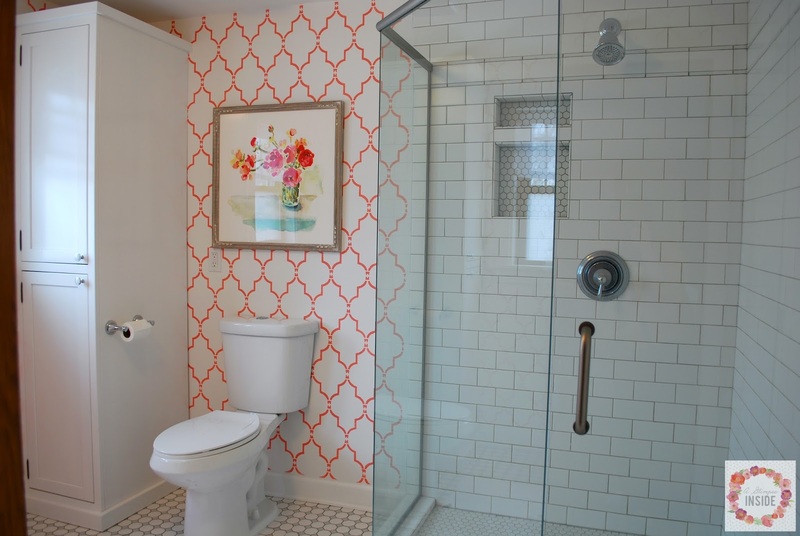 I love everything about our new bathroom! Wow - I bet you're so happy to have a beautiful and functional bathroom. I love that vanity with the mirrors. It turned out really nice. 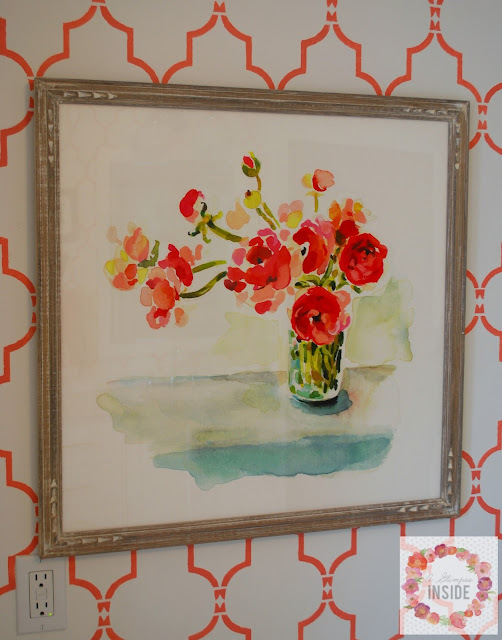 Great stenciling! 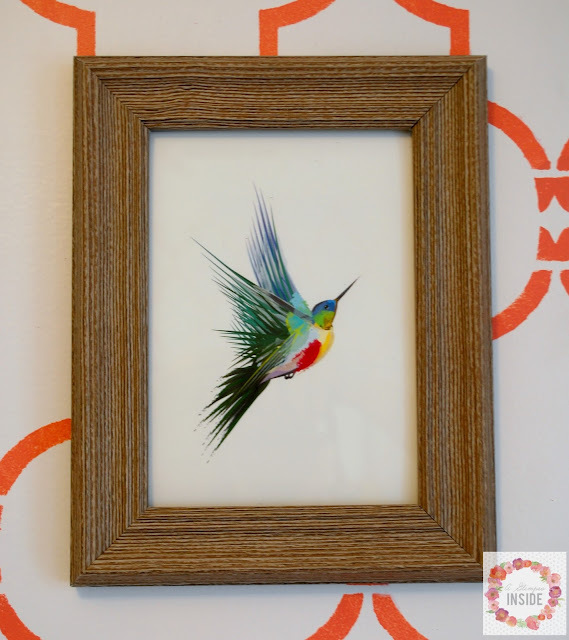 I'm too much of a chicken to go bold like you did - but it all came together perfectly.